According to the National Retail Federation, 30 percent of a retailer’s annual sales comes from the holiday season and Black Friday alone. Yes, 30 percent! You can't afford to skimp on Black Friday marketing. 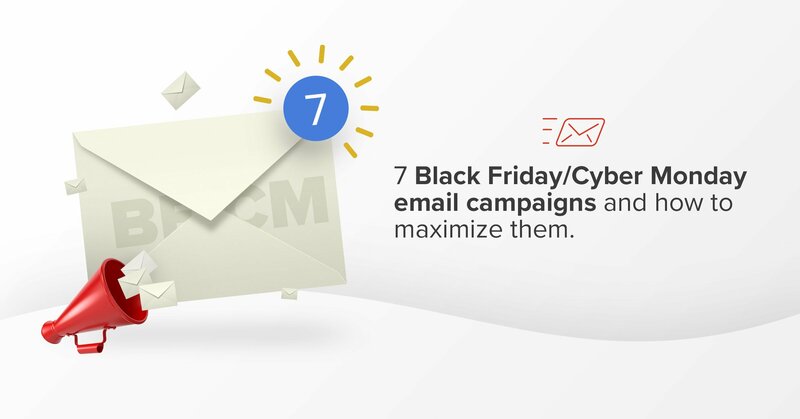 To help you maximize the biggest retail weekend of the year, we've compiled 7 Black Friday & Cyber Monday email campaigns you can steal and use in your own marketing. Note: This guide is an extension to our 12-week Black Friday preparation checklist. Check that out if you haven't already! We'll start with the most basic - but still effective - email you can send. An email simply announcing your sales! 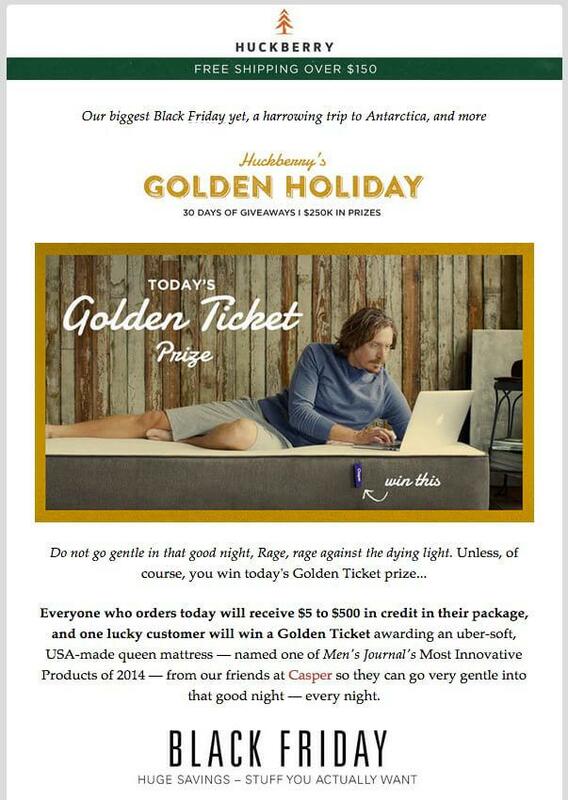 This email by CanvasPop works because it's straightforward and gives people exactly what they want - savings! A clear subject line (like "Black Friday - 40% off everything!") helps get people to open. Then a clear call to action (the big "BUY NOW" button) helps drive openers to the store and eventually to the checkout page. Easy! 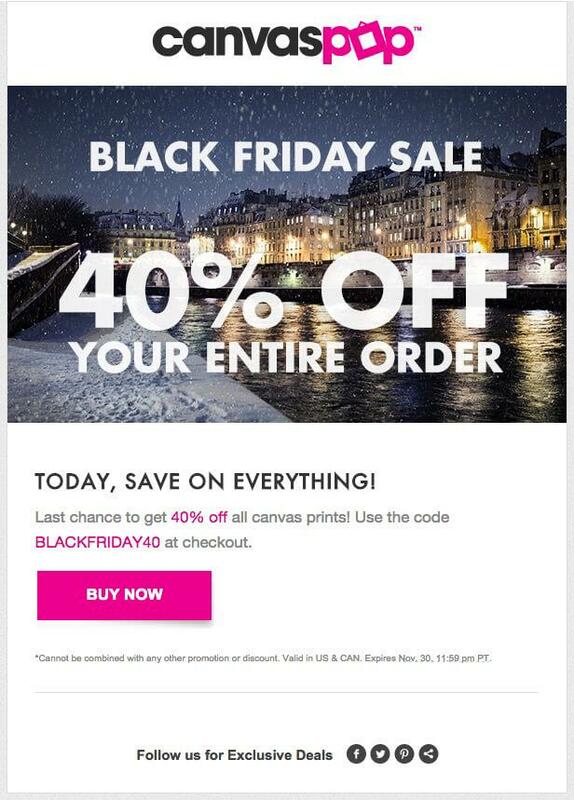 Pro Tip: You can create a Black Friday email banner like the one in the screenshot above using Canva. 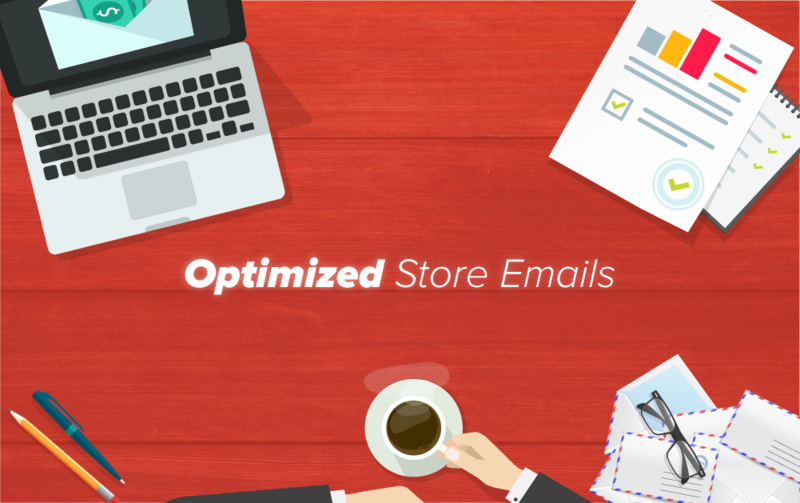 They have email banner templates you can easily customize with a drag-and-drop interface! 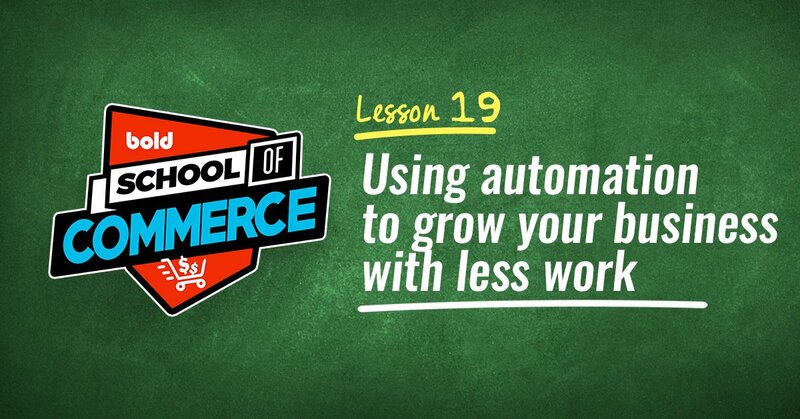 Want to stand out from all the "X% off" emails crowding your customer's inboxes? Pump it up to 100% off with a freebie! 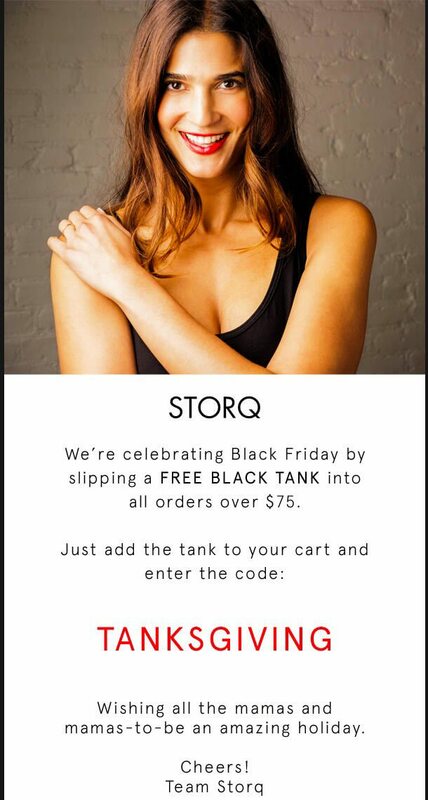 This email by Storq offers a free gift on all purchases over $75 instead of a discount code. Not only is this easy to do (only one discount code to manage), but it's also a great way to increase your average order value from BFCM (Black Friday/Cyber Monday) customers! Use this strategy if your store doesn't typically offer discounts, or if you can’t afford to lower your prices. Don't forget to keep it simple - the coupon code "THANKSGIVING" stands out in this email, and they use a minimal design to avoid distracting their readers. 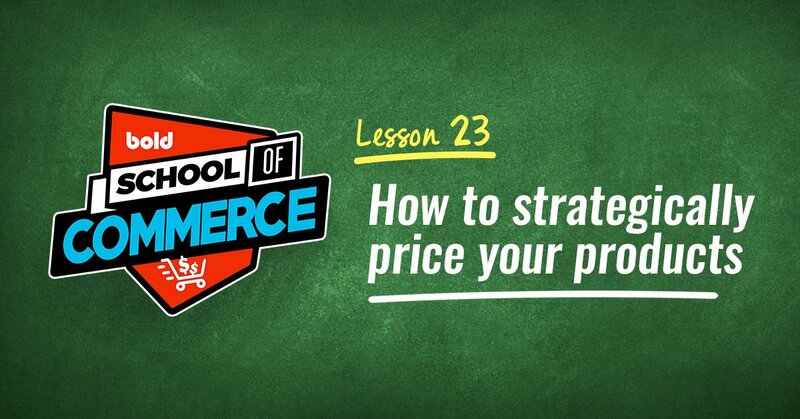 Want to increase your average order value AND have the margins to offer price discounts? Sticking to our trend of minimalist design, this email has two very clear calls to action ("SHOP ONLINE NOW" and "FIND A BOUTIQUE"). It also displays their discounts in big, bold, white font that stands out from the background. Pro Tip: There's something wrong with this email. Do you know what it is? They don't mention what you can buy! Unless your brand is extremely well-known, don't forget to mention WHAT your customers are getting discounts on. Another fun way to nab more sales without hefty discounts is with giveaways! Huckberry used their Black Friday email campaign to promote their Holiday giveaway, which anyone can enter just by purchasing a product on Black Friday. The coolest thing about this is that everyone wins something! Plus, one winner even gets a free queen mattress! Not a half-bad incentive to buy. Everyone loves a good laugh. Why not give it to them? 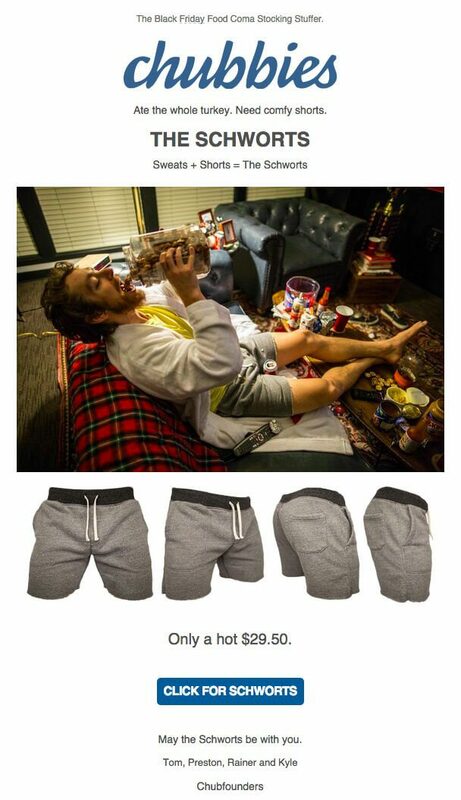 This email by Chubbies (a brand known for being fun-loving and funny) is a great example of injecting some humour into your Black Friday marketing. Not a very creative or funny person? That's OK - just learn some basic psychology humor hacks. 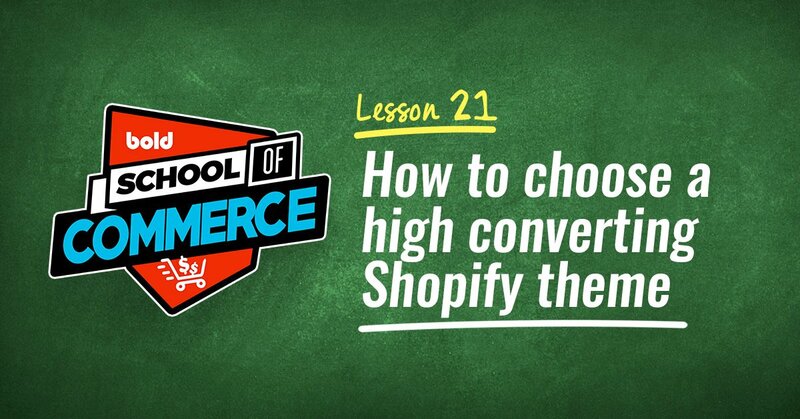 Few things are as effective as scarcity to get your would-be customers to buy. Black Friday is no different! 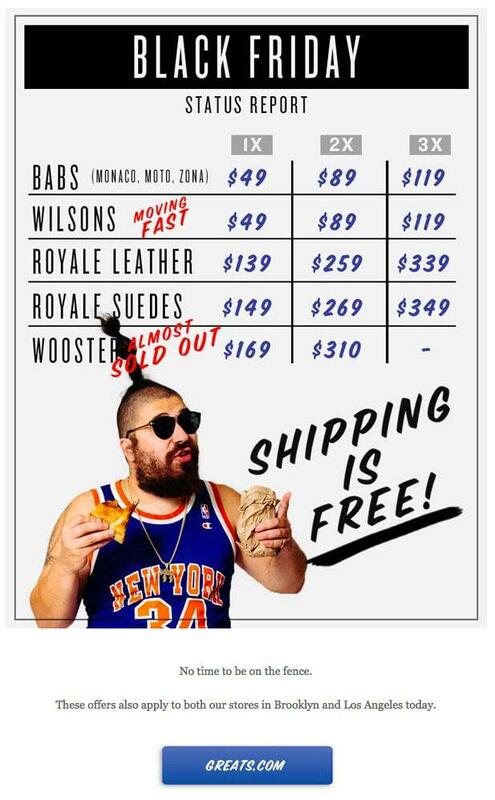 This email by Greats using scarcity wording like "Almost sold out" and "Moving fast" to push their readers to get their deals before they're gone. You can use the same strategy in your emails by limiting the number of items you're selling at a discounted price, or simply by making it known that you have a limited stock. You CAN use these even if it's not true - it's up to your own moral code to decide what's right or wrong. Either way, scarcity works! Something that works almost as well as discounts as scarcity (sometimes even better) is rallying together to support a cause. 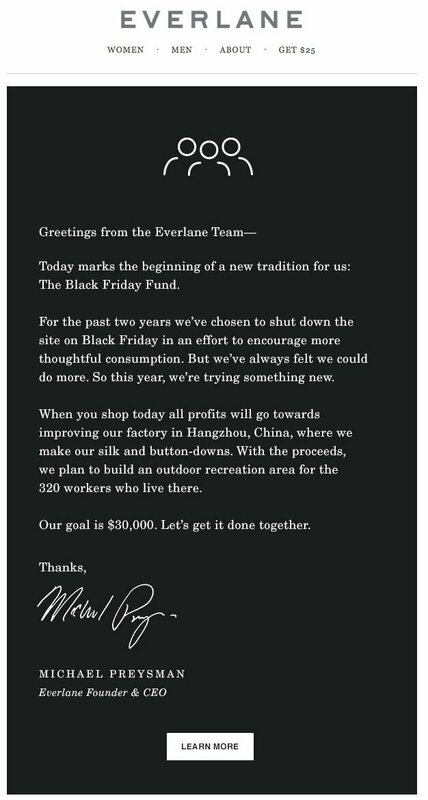 For example, Everlane shares their goal to build an outdoor recreation area for their workers using the profits generated from Black Friday sales. As you can see, your cause doesn't need to be some major charity like you might think. You could just share your personal dreams, ambitions, and goals. What matters isn't the scope of the goal - what matters is your transparency and a push for something better. And that's all I've got for you in terms of Cyber Monday and Black Friday email campaigns! Next up, let's talk about how to write a great subject line. Before anyone sees your deals or call to action, they see your subject line. If they don't open your email, nothing else matters. So how do you write a great subject line? 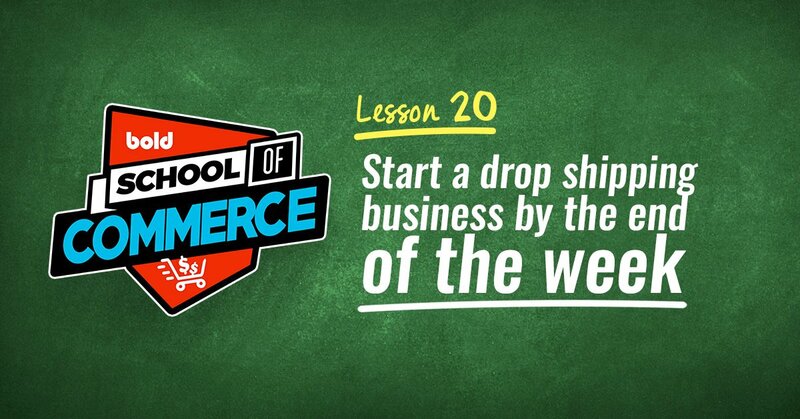 The first strategy is the simplest - just tell people their discount right out of the gates! Black Friday - 40% Off Inside! BOGO FREE for Cyber Monday! You already saw the power of scarcity. Subject lines are no different! Remember the Everlane email example above? Well, that vision you're sharing can help you get more email opens, too. To get the best results, combine some of these strategies! Just remember to keep your subject lines short and sweet so they're not cut off and don't take too much time to read. Finally, let's talk about a few final tips and tricks to get more sales this Black Friday! Because many people work on Black Friday and some businesses don't open sales until certain times, consumers are checking their email (and making BFCM purchases) right from their phone. 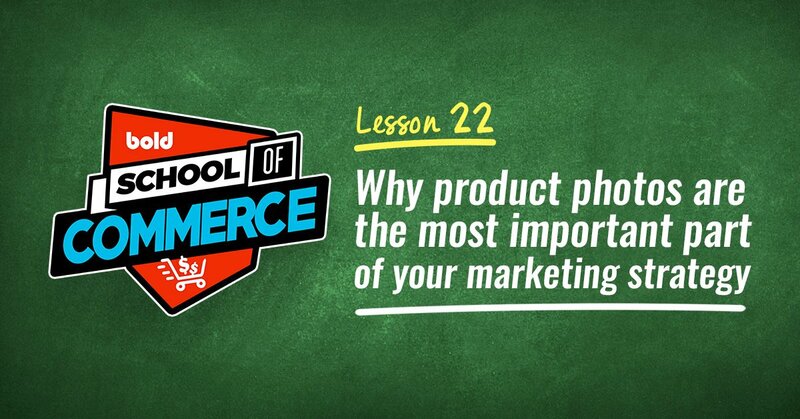 Which means if your email (and your website) doesn't look good on mobile, you'll miss out on sales! While there are tools like mobiReady to see if your site is "mobile-friendly," it's always a good idea to actually grab your smart phone and look at your email and site to see what it really looks like before checking this off your to-do list. Normally you might not want to annoy your customers with loads of email. But on a major holiday weekend like this, people are getting TONS of emails - which means yours can quickly get buried. Don't be afraid to send three or more emails each day. 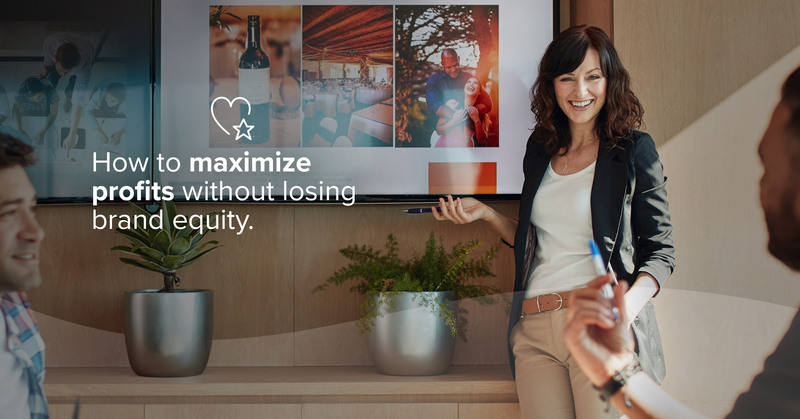 Heck, your customers will appreciate it if they've been waiting for one of your deals (you did send them a teaser email, didn't you?). If you want to get the maximum possible impact from your email marketing campaigns, it's always a good idea to segment your list. Meaning, only send certain deals to certain people who you KNOW are interested in them. Create list segments for frequent buyers, infrequent buyers, unique holiday shoppers, and even non-purchase subscribers. Send unique deals to each segment. The more specific you can get, the more effective this will be. For example, if you segment based on items purchased (like a list of people who only buy a certain brand), you can send them only emails with deals on that specific brand or line of products they're interested in. 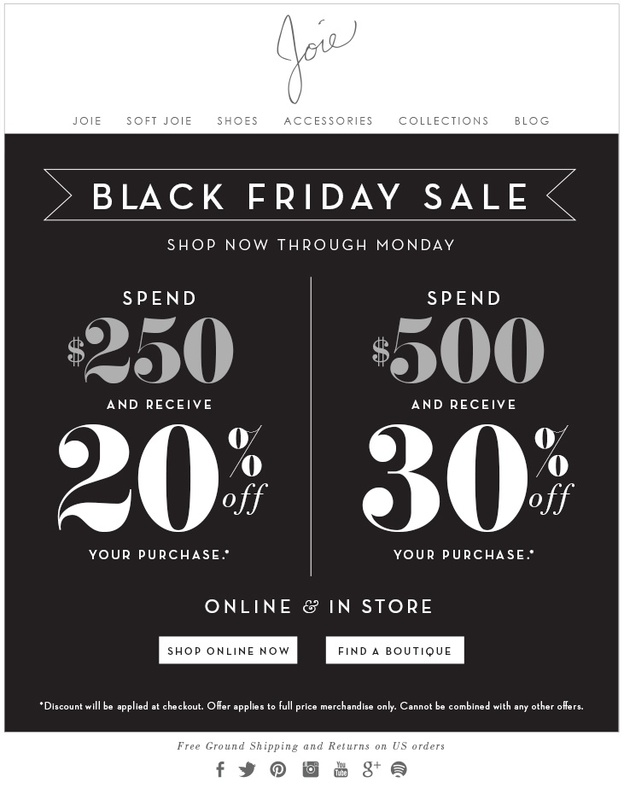 Your Black Friday email campaign can make or break your success. Make sure to schedule your emails to automatically go out on time so you don't accidentally forget to send any out! What are your tips for sending Black Friday/Cyber Monday emails? Let us know in the comments below! And if you haven't already checked it out, be sure to read our 12-week Black Friday checklist to prepare your store for the world's biggest shopping holiday! Or, if you want to know more, check out our Black Friday sale ideas, conversion strategies, and optimization tips all in one place!